Gender Info 2007 is a global database of gender statistics and indicators on a wide range of policy areas, including: population, families, health, education, work, and political participation. It can be used by governments, international organizations, advocacy groups, researchers and others in need of statistics for planning, analysis, advocacy and awareness-raising. Users will find in Gender Info an easy-to-use tool to shed light on gender issues through customizable tables, graphs and maps. It is an initiative of the United Nations Statistics Division, produced in collaboration with the United Nations Children’s Fund (UNICEF) and the United Nations Population Fund (UNFPA). 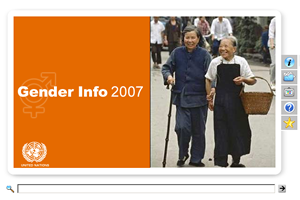 Gender Info 2007 has been adapted from DevInfo technology and presents the most up to date country-level statistics available in the international statistical system as of October 2007.